Today I’ve got 3 random things to share with you because random is just the way things are right now. One Little Word sign ups are open. I’ve done this now for the past 4 years and I’m planning on doing it again. My words so far have been: joy, grace, shine & peace and, while I haven’t made a definite decision about next year’s word, it has been on my mind a lot and I’ve got a few contenders vying for the role. If you want to learn more or it you want to just go ahead and sign up you can visit Ali Edwards. Last Thursday was our annual Christmas Tree lighting on our Town Common and I was warm from my head to my . . . legs. My feet were freezing and I realized – I have it covered when it comes to outdoor clothing except for a pair of warm boots. I’ve got a down coat and plenty of wool hats and mittens and scarves. I’ve got L.L. Bean hunting shoes, which are great for wet weather but they aren’t insulated at all so they don’t keep my feet warm. After the evening was over I was bemoaning my problem and both Dale and Tom said, you need a pair of Sorel boots. In the spirit of “there is no bad weather, only inappropriate clothing,” I ordered these Joan of Arctic boots and they came on Monday and I lurve them. I lurve them so much I’m hoping for an outdoor activity on a cold day so that I can wear them. I don’t think I updated you but we did, in fact, purchase an artificial tree. We got a 6 1/2 foot Classic Fraser Fir from Tree Classics and we love it. The color changing lights are perfect for us since Dale prefers multi and I prefer clear. Right now we mostly have the clear lights on during the day and then we change it to the multi at night. The clear lights are definitely brighter and I think they show the ornaments better but the multi are old fashioned and remind me of my childhood. We both love that it doesn’t have to be watered and that you can brush against it without having a jillion needles fall to the floor. Check back with me after the first of the year when we have to take it down and find a place to store it! And those are my three things this Thursday. Have a great day! I picked out my word for next year. :). Ken would love it if I would give in and get an artificial tree. I’m not there yet, but he keeps trying. Someday perhaps. 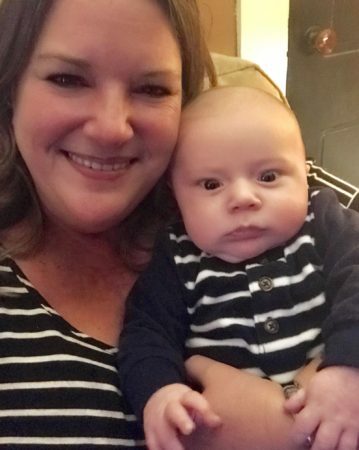 Look at you two in your matching stripes! That photo is just too cute! Good to hear about the tree. I miss the aroma of a tree this time of year. I love, love, love those boots! And the matching shirts of course! We just got an artificial garland for above the mantel as the new fireplace makes it way too hot for real. It’s surprisingly nice! Cute boots!! Mine are several years old and not quite so stylish. They sure are warm, though. LOVE the matching shirts! So cute! Aaak! I wish you hadn’t introduced me to Ali Edwards. I just spent over an hour poking around on her blog and I’ll be returning to it as soon as I finish typing this. Her site is like entering Pinterest. 🙂 I’ll also be joining the One Little Word project. I signed up for the OLW class. I have had a word but have not done the class for a few years. And I am having cold feet this week too. The temps dropped so quickly that I haven’t made the transition to warmer socks. I have picked out my word for next year. I hope it works to alter my outlook. That photo is adorable. Did Jackie call you the night before to see what you were wearing? I’ve never done the word thing but this year may be the year. Will have to see if I can find one that fits what I need. Love the picture! And the boots are cute. You and Jack look so cute together! I need a pair of warm boots, but I’m afraid if I buy a pair we’ll NEVER get snow! Those boots are super cute! You and Jack look adorable in your stripes. As I was reading through item #2, I thought “she needs a pair of Sorel boots!” Apparently I’m not the only one who thought that! 🙂 My first pair lasted over 10 years and I’ve had the second for a couple years now. I’m always amazed at how warm they keep my feet through our cold Michigan winters. You will love them! I bought the 7-1/2 foot version of that same tree from Tree Classics about 4 years ago and I do love it because it looks VERY real. We alternate between the artificial one and a real one each year, although I’m using it this year again since Grace is out of the country until right before Christmas and in no way was I gonna deal with all that ‘real tree’ set up and maintenance by myself! I also got a stand with wheels and a big ‘bag’ that hangs out under the tree while it is in use, then is pulled up over the tree and cinched at the top. I have hardwood floors and no steps, so I just take off the ornaments, pull that bag up (with help) and roll that puppy into a corner of the guest room. I move it into the yarn room when I have guests. I swore most of my adult like I would NEVER have an artificial tree…. (also said I’d never have gas logs, which I got 3 years ago.) The reality is that “aging” changes one’s viewpoint!